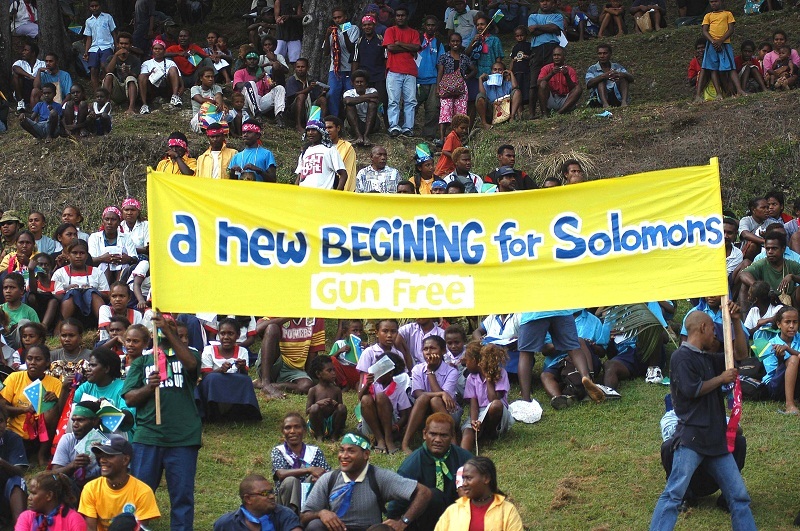 The Tensions were a period of civil unrest in Solomon Islands mainly characterised by fighting between different ethnic militant groups. In December 1998, existing ethnic tensions on Guadalcanal rapidly escalated. 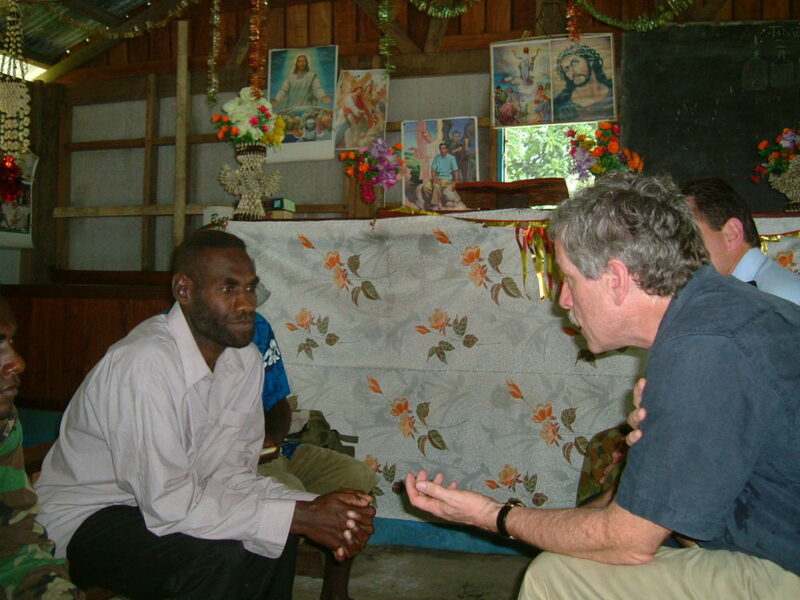 The Solomon Islands Government struggled to respond to the complexities of this evolving conflict. There were also a number of attempts at reconciliation but to no avail and by late 1999, the government had declared a state of emergency. 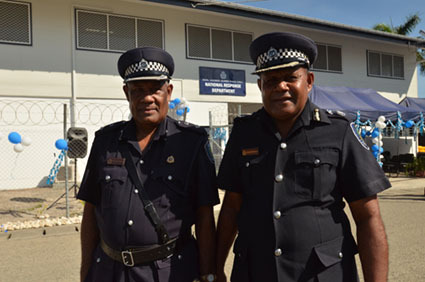 The prevailing atmosphere of lawlessness, widespread extortion, and ineffective police prompted a formal request by the Solomon Islands Government for outside help. 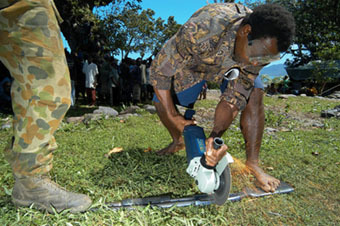 This led to the creation of the Regional Assistance Mission to Solomon Islands (RAMSI) led by Australia and New Zealand. 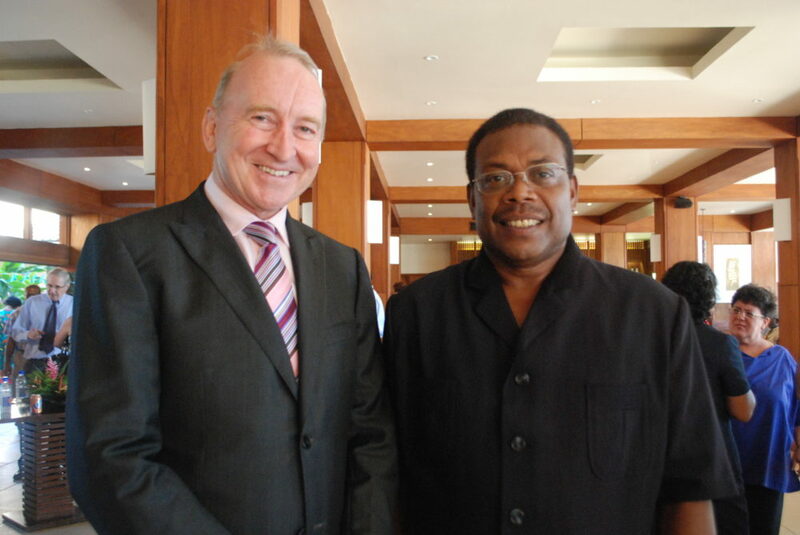 Solomon Islands Prime Minister Sir Allan Kemakeza requests urgent assistance from Australia. 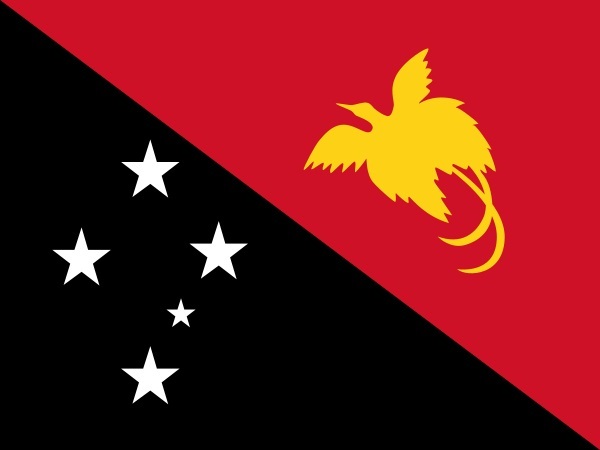 Australia offers to lead a regional assistance mission if a formal request is made by the Solomon Islands Governor-General, on the advice of Cabinet, and the mission has regional endorsement. 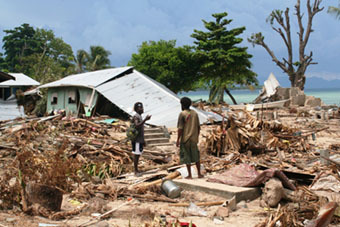 Pacific Islands Forum Foreign Ministers endorse the RAMSI deployment under the Biketawa Declaration in 2000. The Declaration enables Forum members to act in times of crisis or in response to a member’s request. 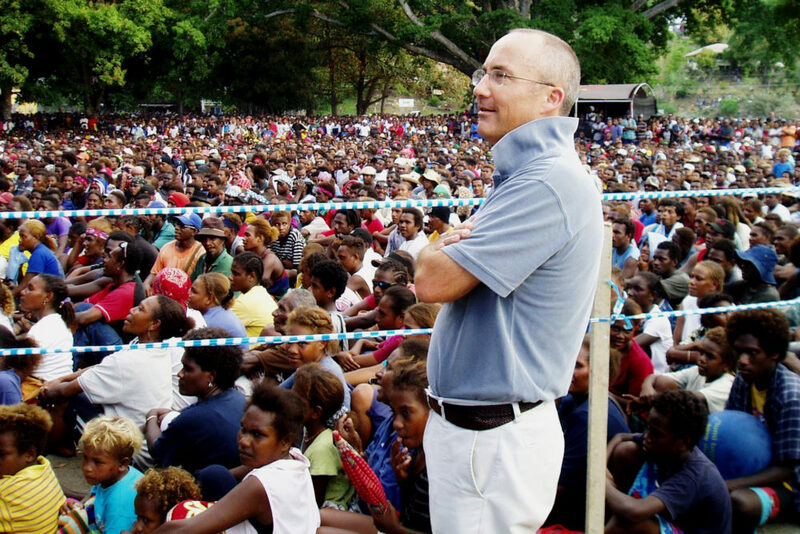 Thousands of Solomon Islanders gather at Honiara’s Henderson International Airport to witness the arrival of more than 2,000 soldiers, police and civilians from Australia, Cook Islands, Fiji, Kiribati, Nauru, New Zealand, Papua New Guinea, Samoa, Tonga and Vanuatu. 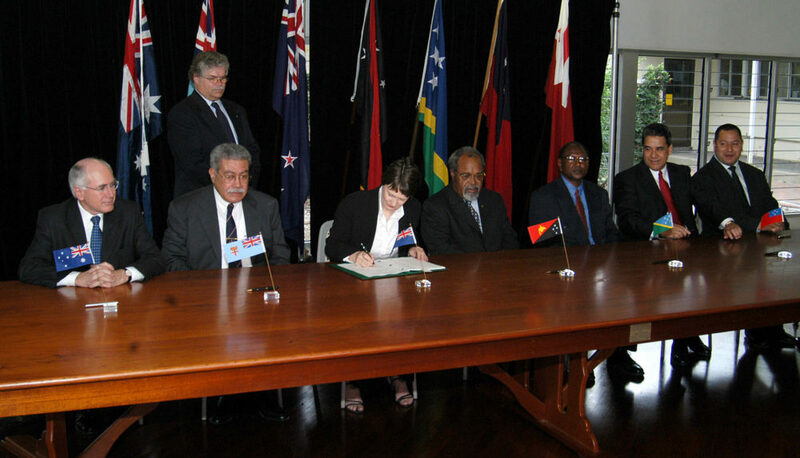 The RAMSI Treaty, which set out the mission’s mandate, was signed in Townsville by the Prime Ministers of Australia, Fiji, New Zealand, Papua New Guinea and Tonga, and senior officials from Solomon Islands and Samoa. Thousands of weapons are handed in across the nation by former militants, police and other gun-holders during a 21-day firearms amnesty. 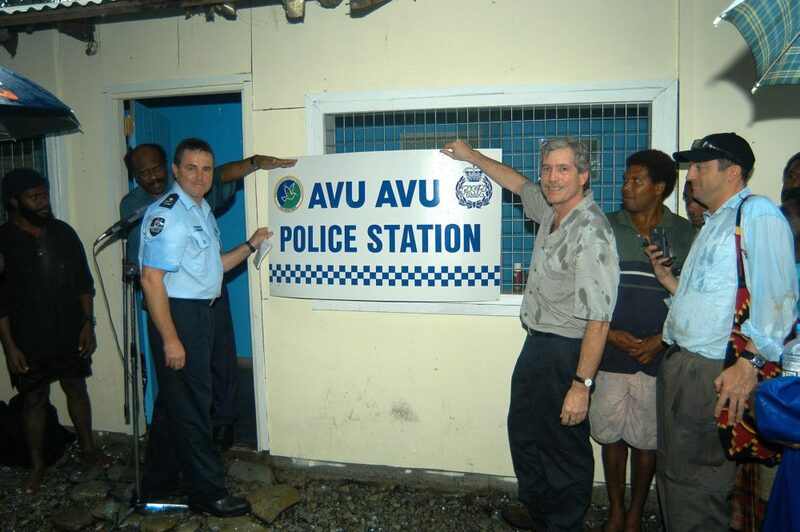 The RAMSI Participating Police Force (PPF) establishes its first provincial presence in Avu Avu, restoring a police presence on the Weathercoast for the first time in nearly five years. Over coming months, RAMSI establishes a presence in 17 provincial locations. Guadalcanal militant leader Harold Keke surrenders peacefully to RAMSI Special Coordinator, Nick Warner, and Participating Police Force Commander, Ben McDevitt. 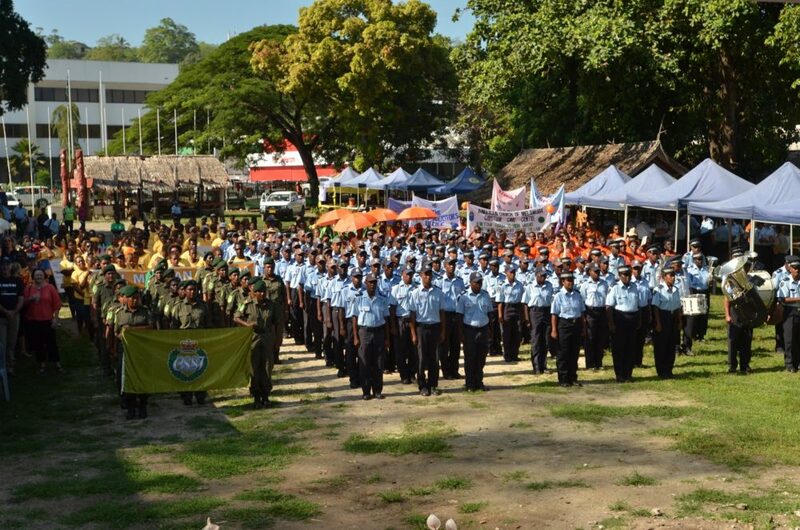 A major peace rally fills the streets of Honiara celebrating the nation’s newfound peace. 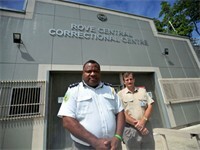 Rove Central Prison re-opens, with the first 12 cells of what becomes a 300-bed high security facility. 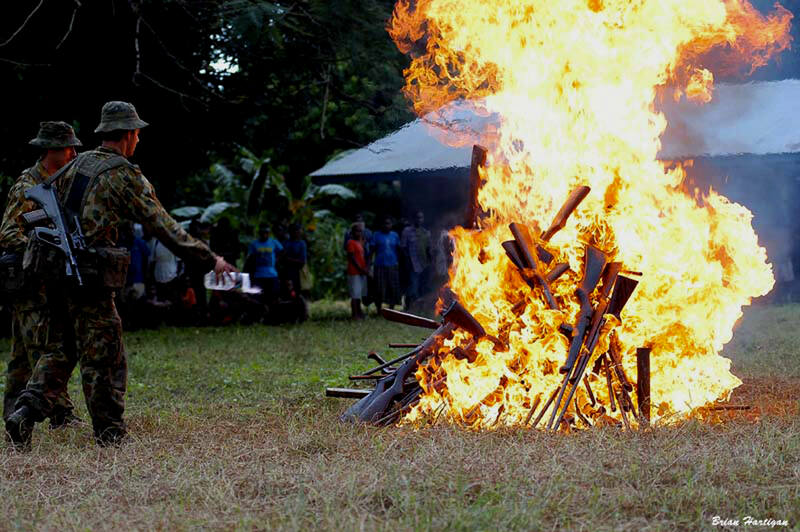 3,700 firearms destroyed, 340 arrests, Government finances stabilised and payroll restored. 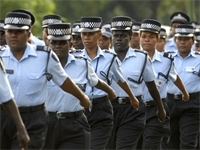 Papua New Guinea agrees to contribute police. 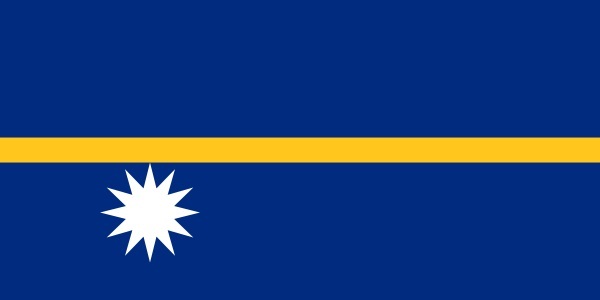 Nauru agrees to contribute police. 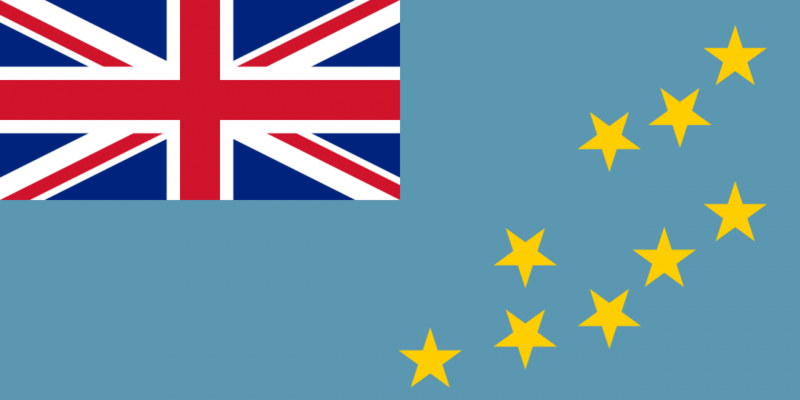 The small island nation of Tuvalu contributes police officers. Participating Police Force officer Adam Dunning shot dead in Honiara, RAMSI’s first and only casualty by armed opposition. The trial of renegade Guadalcanal Liberation Force commander Harold Keke – the first major Tensions-related trial – begins. 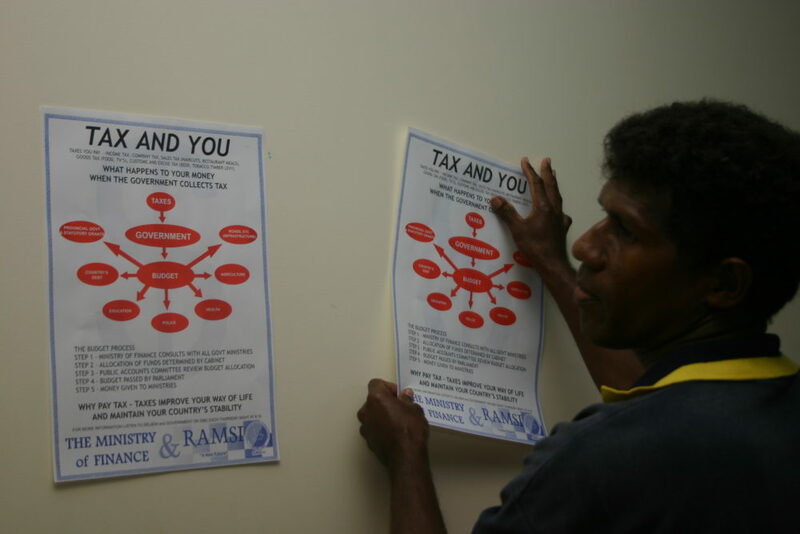 RAMSI launches a civic education project to educate citizens about their democratic rights and responsibilities in a democracy ahead of the 2006 General Election. 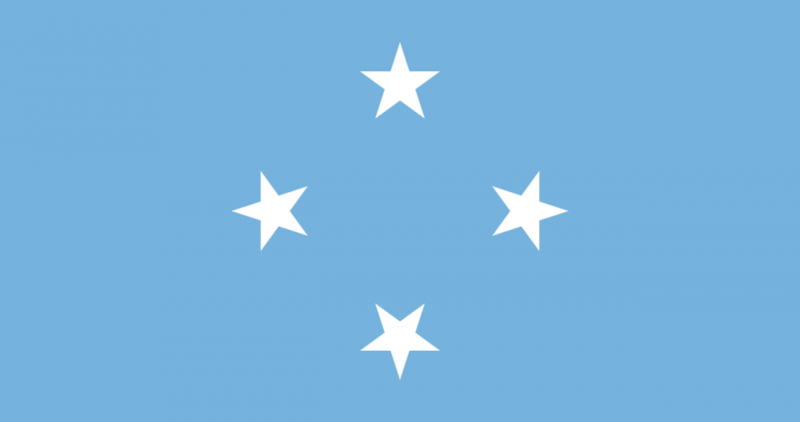 The Federated States of Micronesia contribute police to RAMSI. Two-days of riots erupt and wide-scale looting and burning of Chinese-owned businesses follow the 5 April election and subsequent swearing in of Prime Minister Snyder Rini. 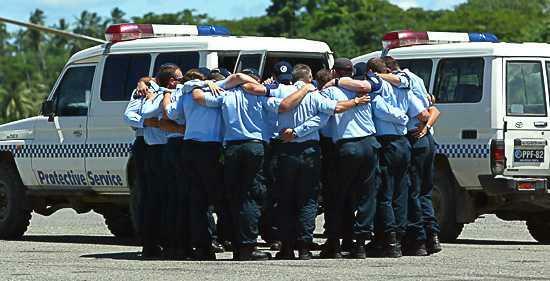 25 RAMSI police officers are seriously injured. 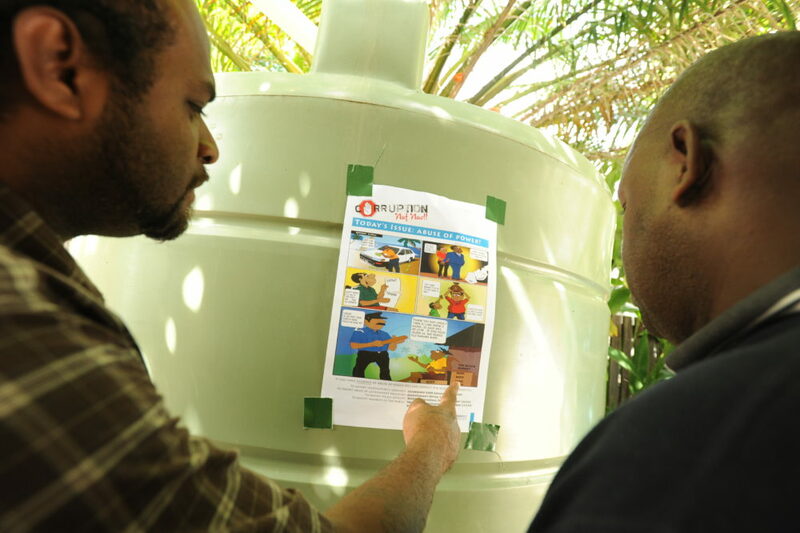 People’s Survey Pilot conducted in selected areas of Honiara and Guadalcanal, Malaita, Western and Choiseul Provinces. 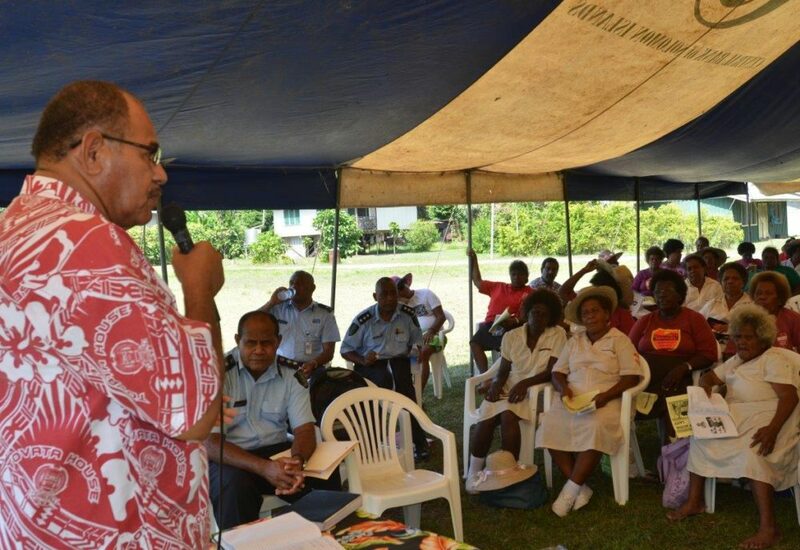 The annual People’s Survey would show that public support for RAMSI never waned, remaining above 85 per cent. 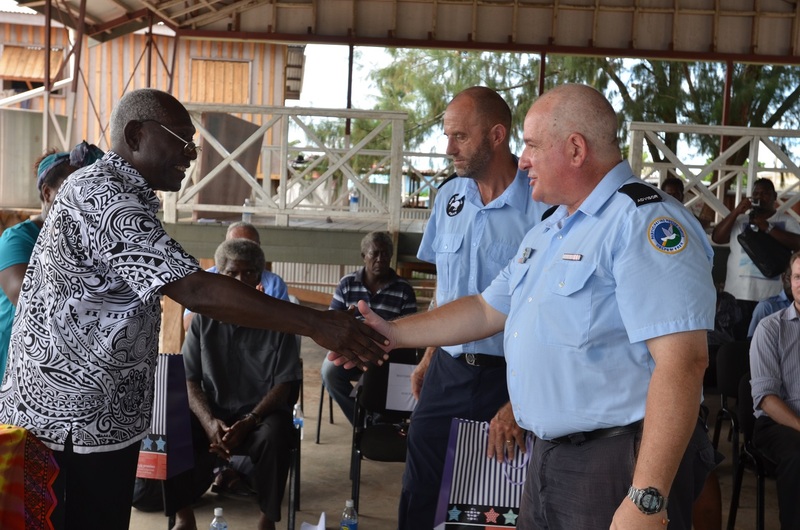 RAMSI Community Outreach Program launches with representatives of RAMSI’s civilian, police and military components, along with Solomon Islands Government counterparts. 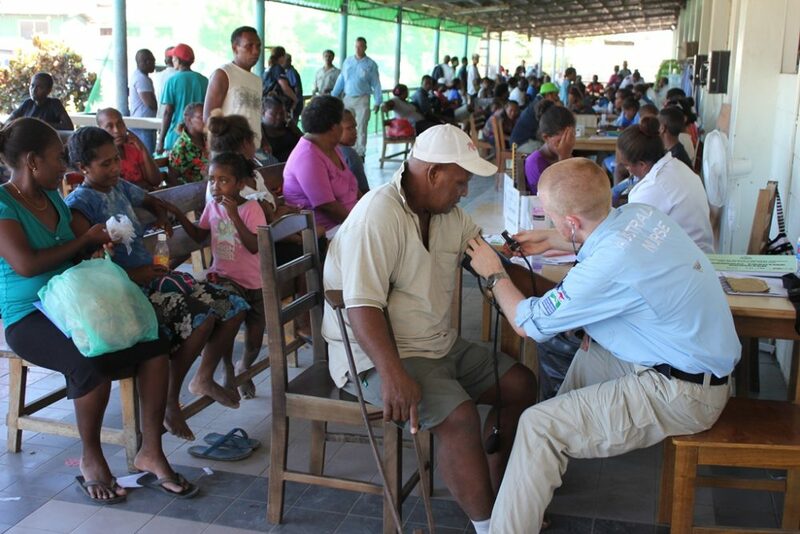 RAMSI assists with relief efforts after a large earthquake and tsunami struck Solomon Islands’ Western provinces, killing 52 people and destroying 900 homes. 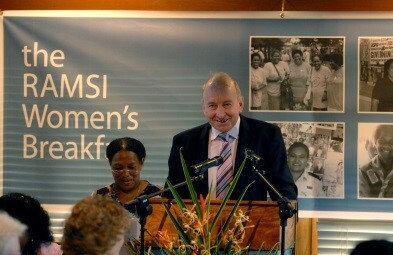 First RAMSI Women’s Breakfast held for more than 200 women marking International Women’s Day. 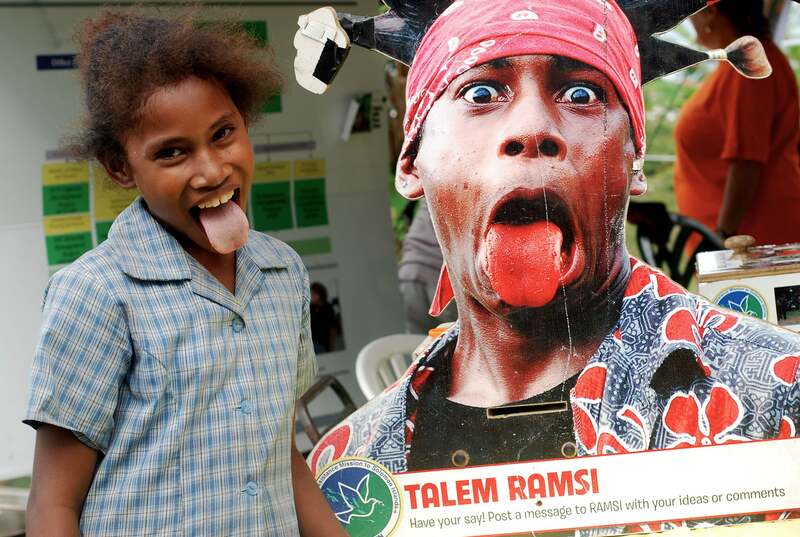 RAMSI apologises for the tragic death of a young Solomon Islands woman in a fatal accident involving a RAMSI vehicle driven by an off-duty Samoan police officer in Honiara. First Special Coordinator’s Award for Women presented to community volunteer, Betty Komasi, in recognition of her founding of the Mercy School in the Burns Creek settlement. 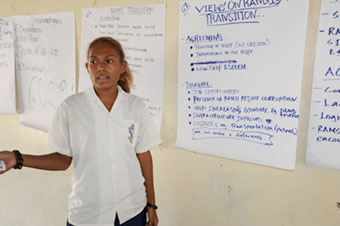 RAMSI also appoints a Gender Adviser to strengthen efforts on behalf of women and men of Solomon Islands. Partnership Framework between Solomon Islands Government and RAMSI endorsed by both parties and the Forum Ministerial Standing Committee on RAMSI. 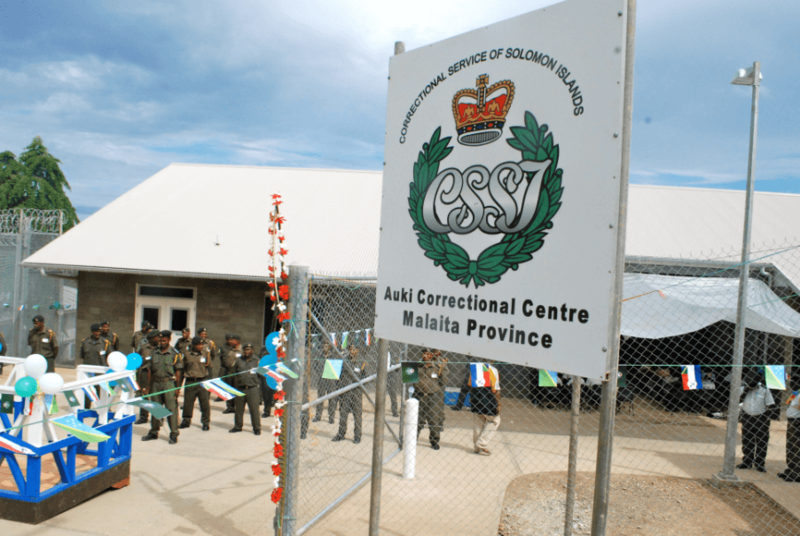 The new Correctional Centre in Auki, Malaita Province, meets all the United Nations standards for prisoner accommodation and treatment. 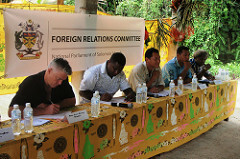 The Solomon Islands Foreign Relations Committee praises RAMSI for its significant achievements and concludes that the greater involvement of the Pacific Islands Forum in the Mission’s governance has been effective. Launch of the new Public Service Code of Conduct, which was developed with assistance from RAMSI. 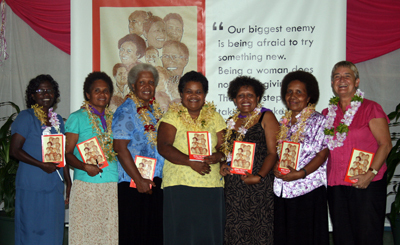 Being the First: Storis Blong Olketa Mere lo Solomon Aelan, the first book on Solomon Islands’ women leaders launched with RAMSI’s assistance. 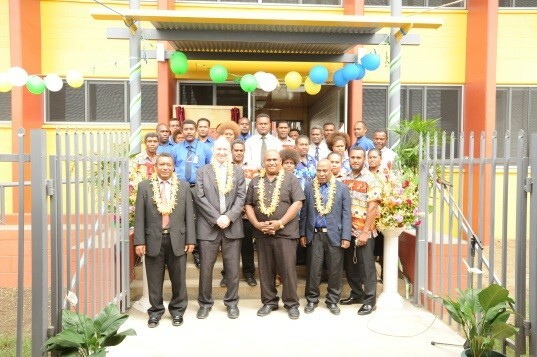 New court complex opens in Auki, Malaita province, jointly funded by Solomon Islands Government and RAMSI. 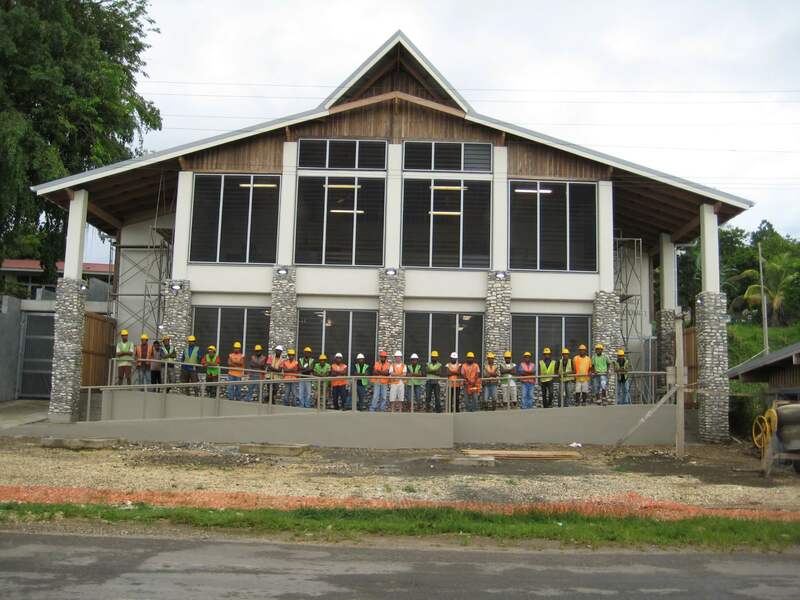 Leadership Code Commission and Ombudsman’s Office move into new shared facilities built by Solomon Islands and RAMSI. 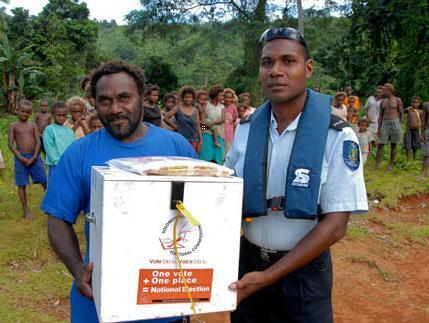 RAMSI helped with civic education across the nation about the parliamentary process, encouraged women to run for office, strengthened election management, improved voter registration systems, transported ballot papers and ballot boxes, and bolstered Royal Solomon Islands Police Force security operations ahead of the election. 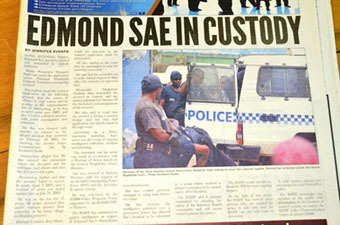 Fatal shooting of a Solomon Islander on the outskirts of Honiara. First and only time that the actions of RAMSI personnel operating in the line of duty result in the death of a Solomon Islander. Revenue collections exceed SBD1 billion in 2010, the first time in the history of the nation. 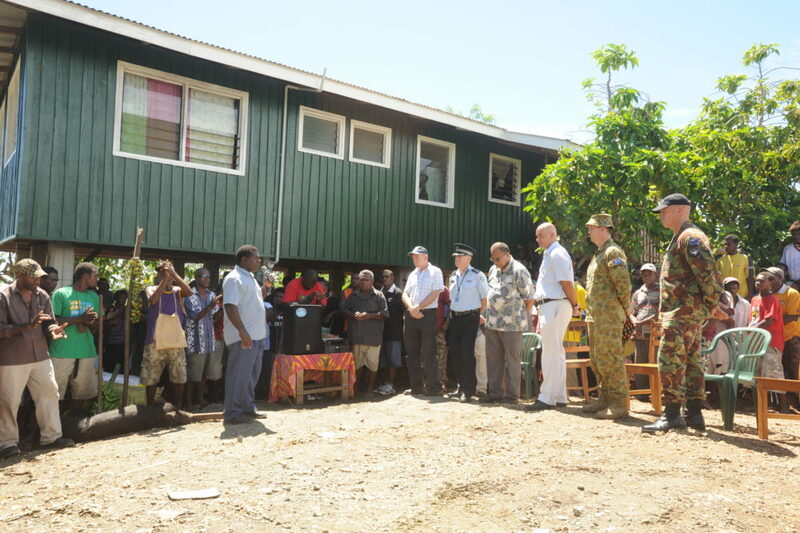 First of 146 new police houses formally handed over to RSIPF officers and their families in Honiara by RAMSI’s Police Accommodation Project. 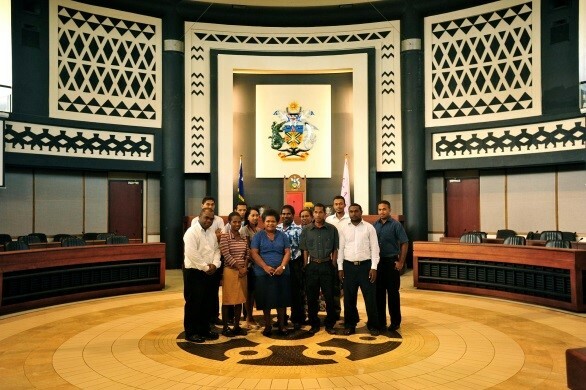 Dovetail dialogue on RAMSI’s Transition held between the Solomon Islands Government and RAMSI officials. RAMSI Police withdraw from the first provincial police post in Buala, Isabel Province, as part of the Transition to a solely police assistance mission. 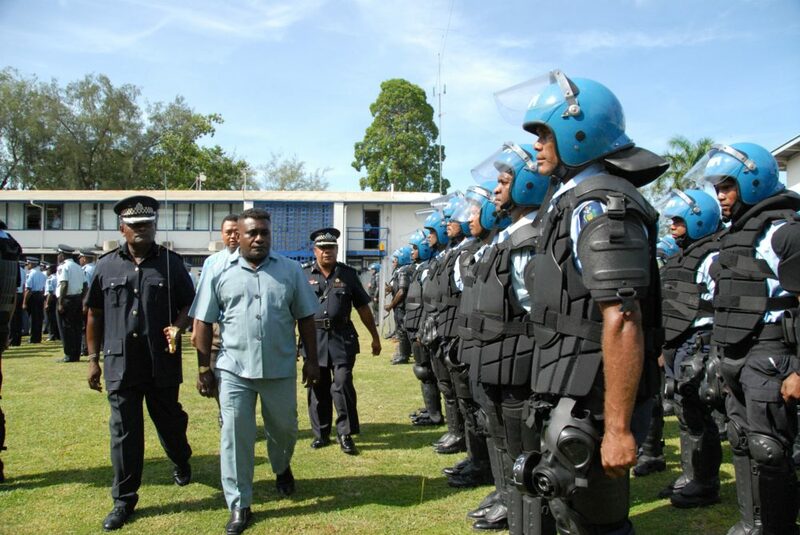 Solomon Islands Police Response Team lead the quelling of a near-riot in Honiara following the election of Gordon Darcy Lilo as Prime Minister. Mere Blong Iumi, Stori Blong Oketa documentary capturing the experiences of Solomon Islands women produced by the RAMSI Public Affairs Unit premiers on local One Television. Achievements of the Solomon Islands-RAMSI partnership feature in an exhibition on peacekeeping at United Nations Headquarters in New York. 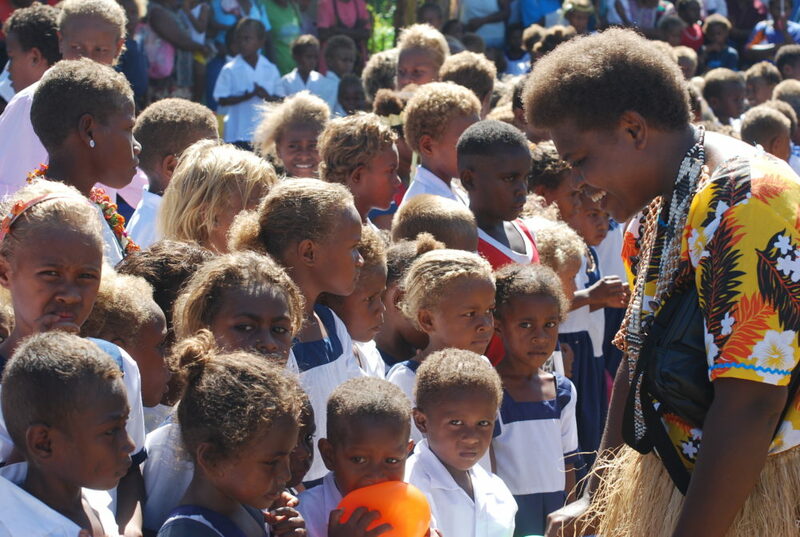 The exhibition also toured Australia, New Zealand, Samoa, Solomon Islands and Vanuatu. New RSIPF Provincial Police Headquarters opens in Isabel Province. 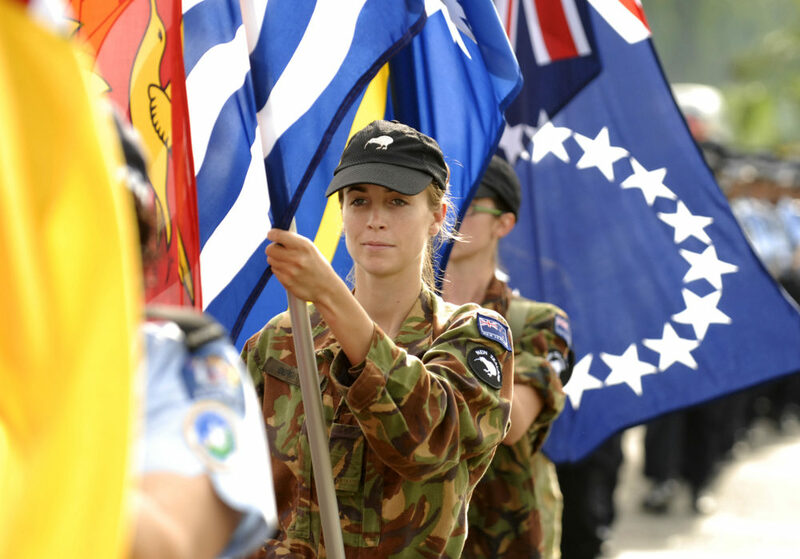 The final New Zealand Defence Force platoon departs. 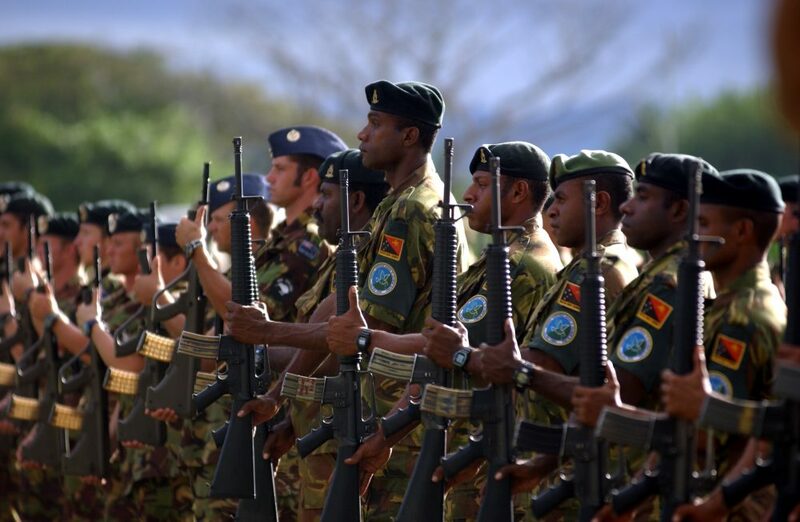 Papua New Guinea Defence Force troops are farewelled as RAMSI prepares to become a solely police assistance mission. 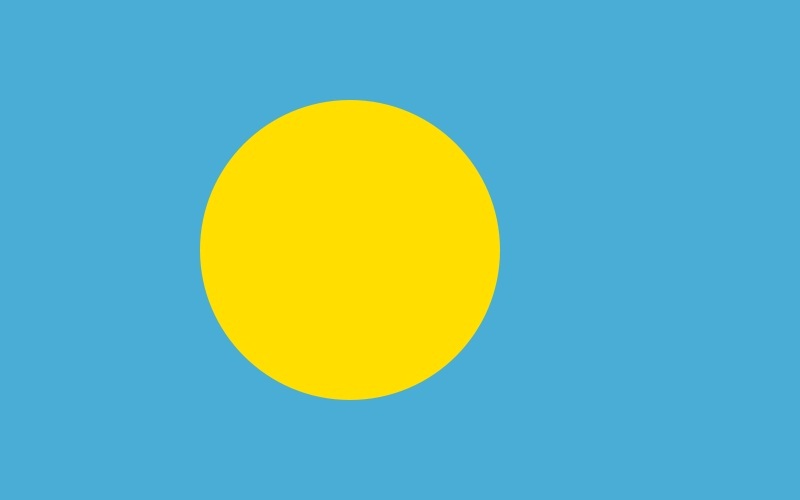 Australia is Solomon Islands’ main development partner. 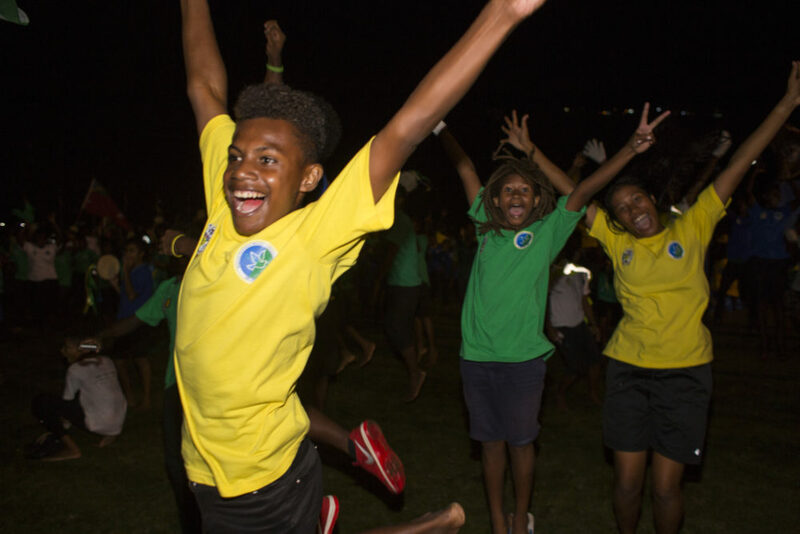 Australian development assistance to Solomon Islands, continues to focus on improving health, education, water and sanitation, transport, telecommunications, law and justice, rural livelihoods and effective governance. 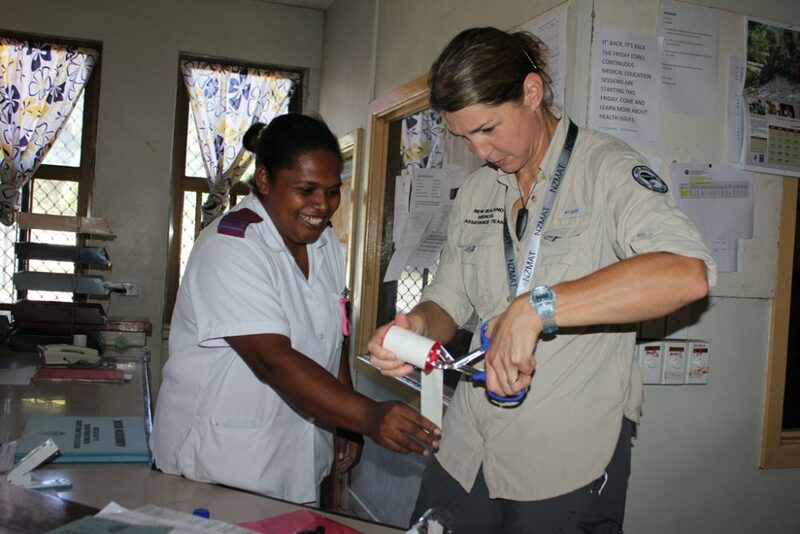 RAMSI’s civilian development activities shift to Australian and New Zealand aid programs and other development partners. 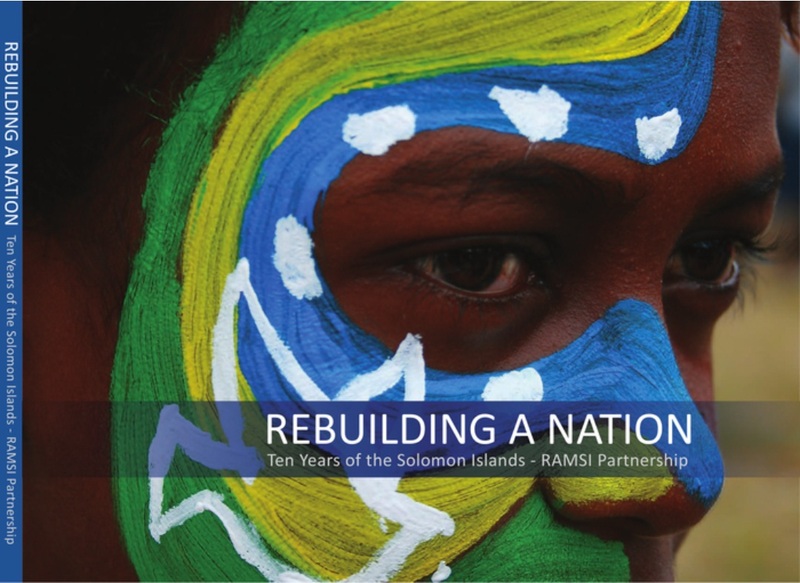 Written to mark the 10th anniversary of RAMSI, ‘Rebuilding a Nation in Partnership’ examines RAMSI’s achievments. 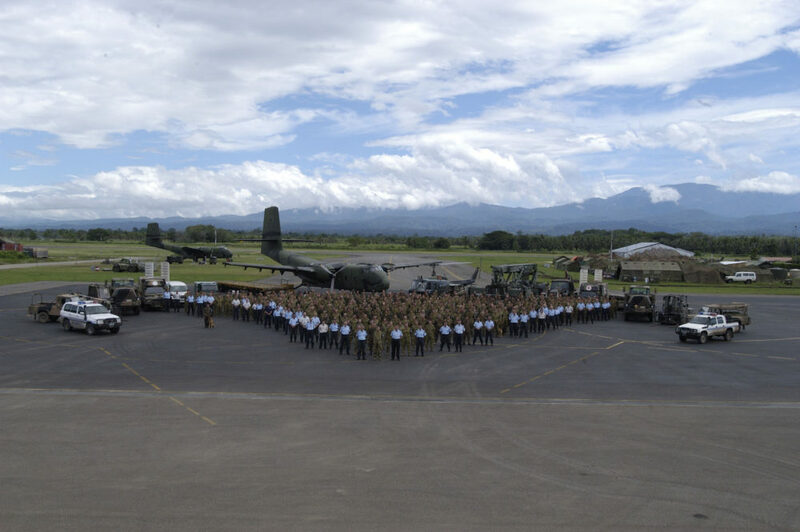 The book is a tribute to the Government and people of Solomon Islands and to all those people who worked as civilians, soldiers and police officers for the Mission. PPF-RSIPF Drawdown Strategy 2013-2017 agreed, including an agreement that RAMSI would reduce its resources and footprint with a view to transferring full responsibility for policing and national security before 30 June 2017. 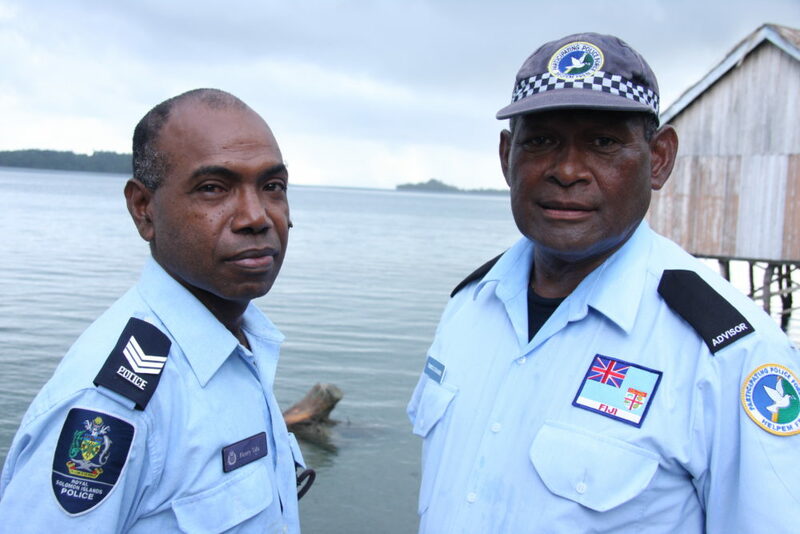 RAMSI announces it has gifted 32 boats to the RSIPF, increasing its fleet four-fold, as part of the maritime mobility plan funded jointly by the Solomon Islands Government and RAMSI. 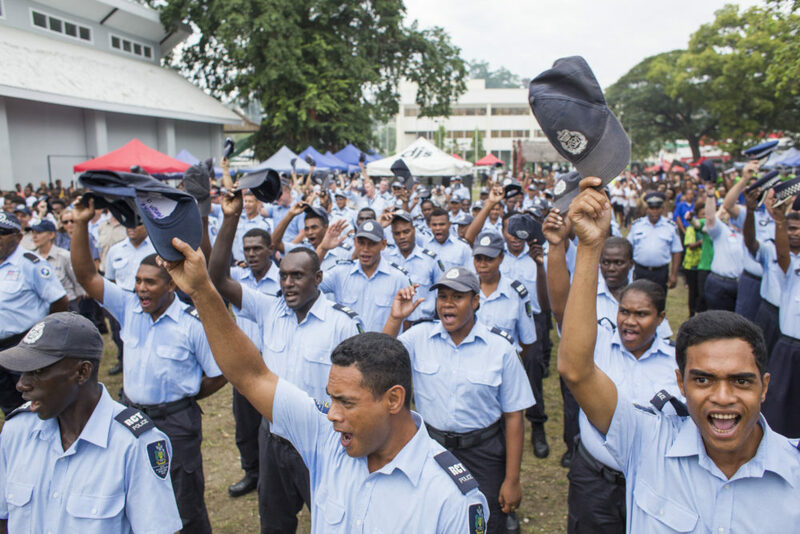 The new Police Act 2013, which was developed with RAMSI’s support, comes into effect and provides the necessary legal foundations to support a modern RSIPF. 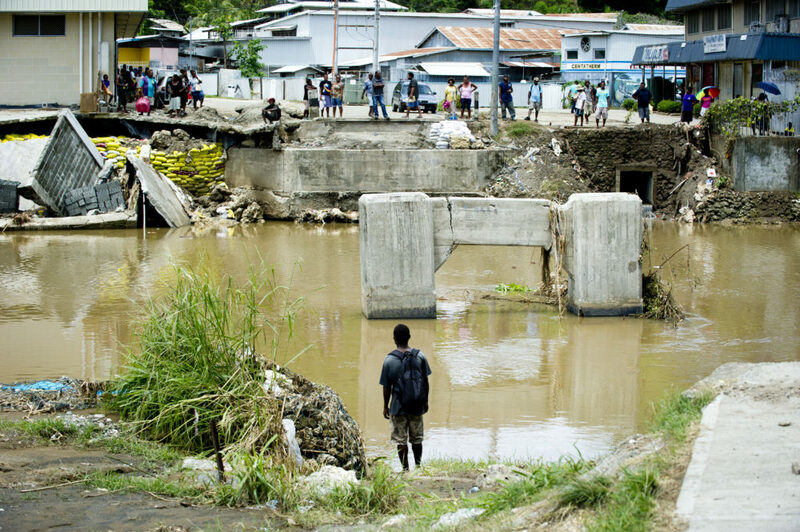 Flash flooding on Guadalcanal causes significant damage to homes, infrastructure and livelihoods, affecting an estimated 52,000 people. 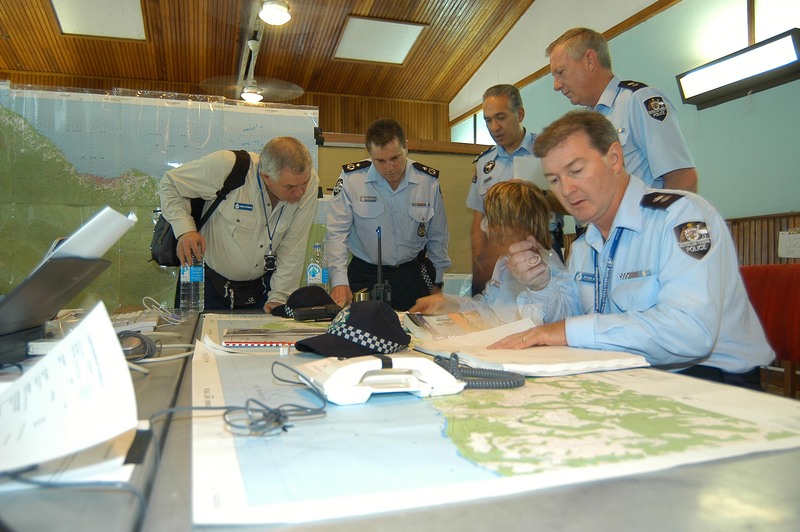 The RSIPF leads the overall response to the floods, with RAMSI support in operational planning, aerial support, search and rescue operations and patrols. 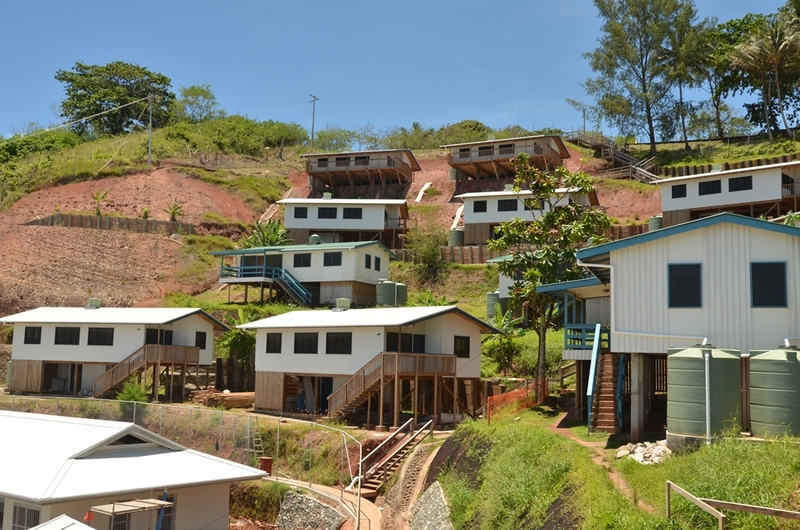 Gold Ridge Mine suspends its operations and RAMSI deploys technical experts to assist the Solomon Islands Government assess risks from hazardous materials on site. 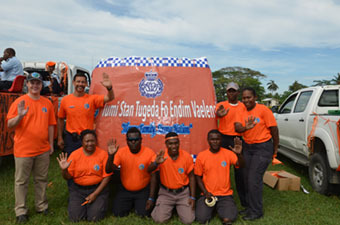 Community frustration with flood relief efforts is managed by the RSIPF Police Response Team with support from RAMSI and Australian High Commission. Seif Ples clinic for victims of family and sexual violence opens with support from the RSIPF Sexual Assault Unit and RAMSI. Since opening in 2014 the Seif Ples Clinic has been offering a place of safety and access to urgent medical care for survivors of violence. 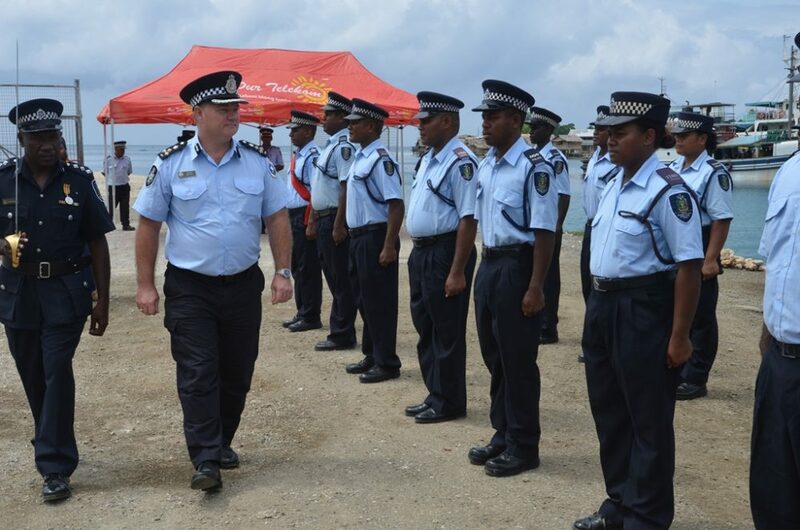 RSIPF officers conduct training in Public Order Management for Nauru Police Force members. 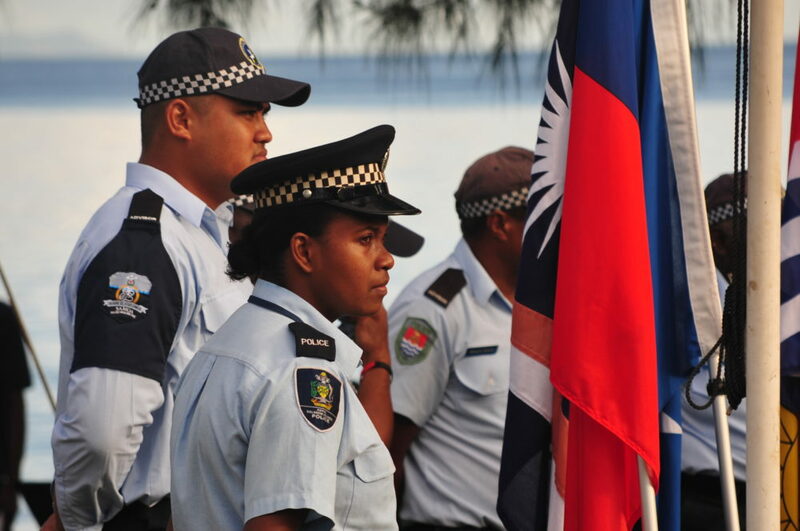 Before RAMSI left, the RSIPF would also train police in Samoa and Vanuatu. 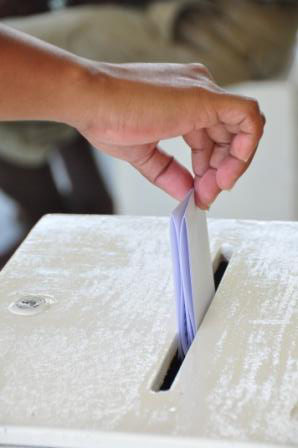 Solomon Islands national election is declared free and fair by electoral observers. 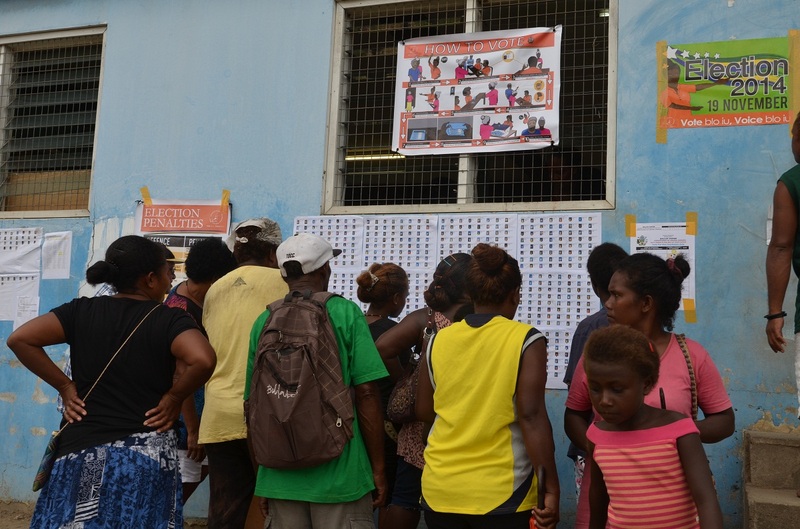 The RSIPF successfully conducts its largest and most visible operation since 2003, supported by RAMSI, which increased its numbers to support election security operations. 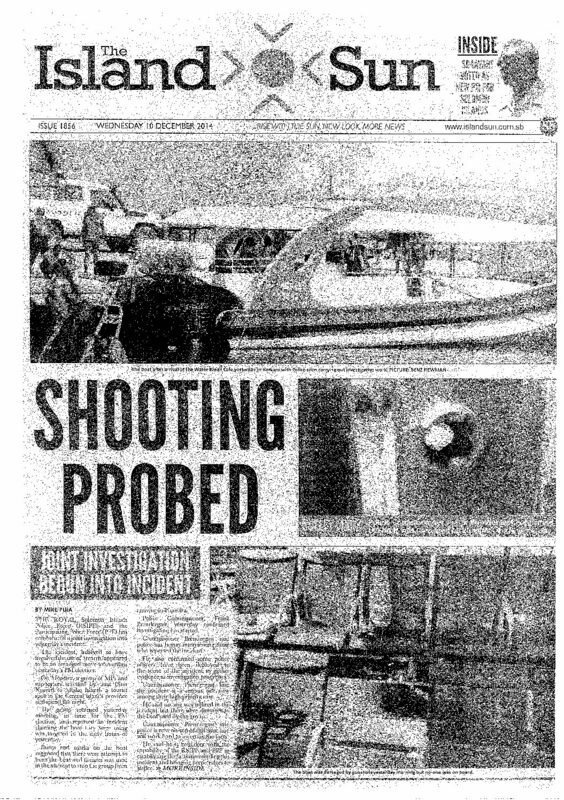 Firearm and arson attack near Mbike Island, Central Province, on a boat that had transported 17 newly elected Members of Parliament. No one injured or killed. Provincial consultations on the limited and staged rearmament of the RSIPF commence. 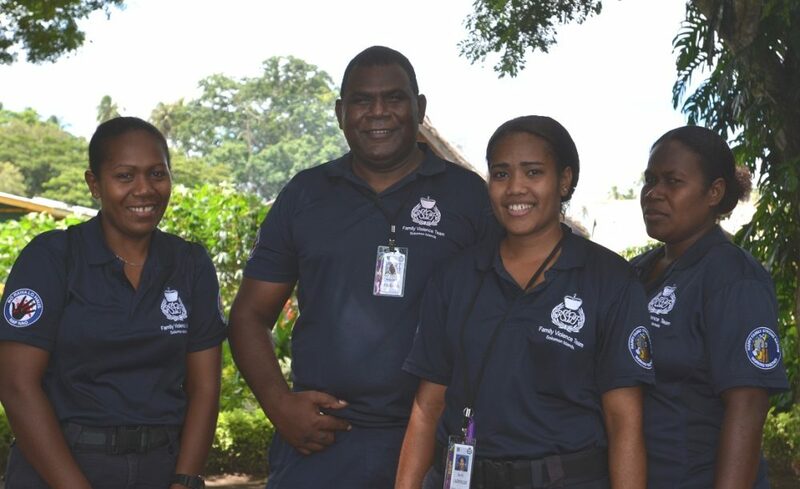 RSIPF successfully lead the planning and delivery of security for the Melanesian Spearhead Group Leaders’ Summit in Honiara. 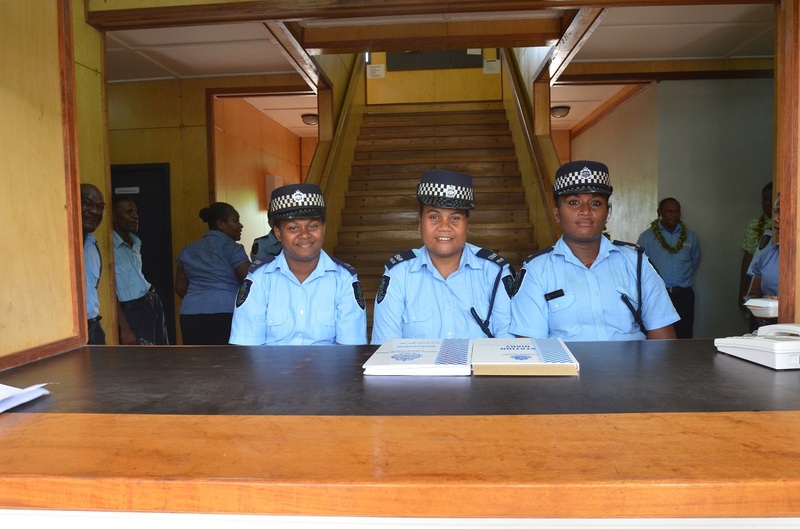 RAMSI hands over new RAMSI-built police station in Auki, Malaita Province. 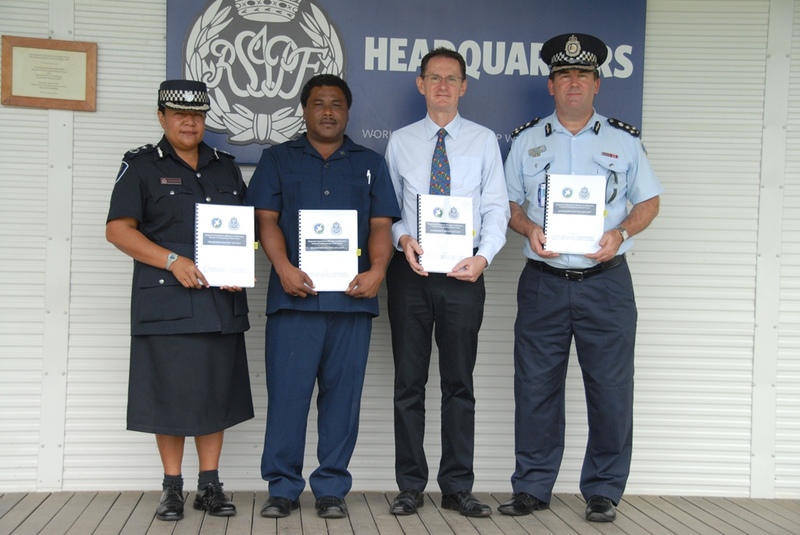 The influential ‘Appropriate Cost of Solomon Islands Police Service’ report presented to Solomon Islands Government, and later endorsed by Cabinet. 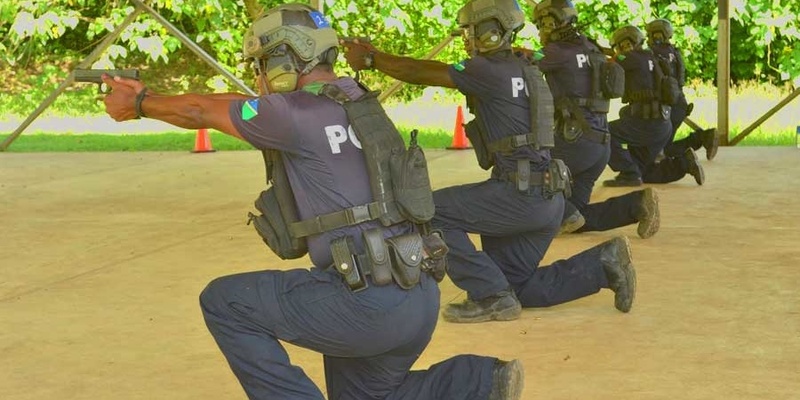 Auki-based RAMSI police advisers withdraw, 12 years after setting up the post to support the RSIPF in Malaita Province. 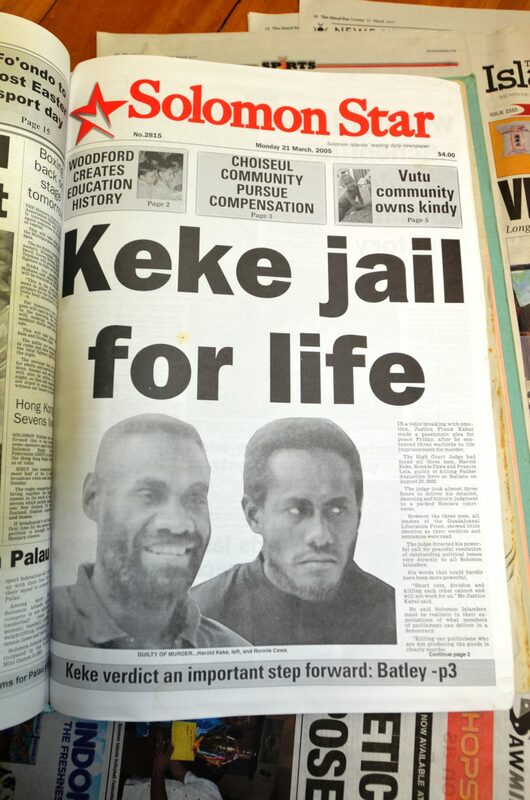 Long-time fugitive Edmund Sae arrested in Malaita for the 2003 murder of former Police Commissioner Sir Frederick Soaki, closing the chapter on one of the last major Tensions-era crimes. 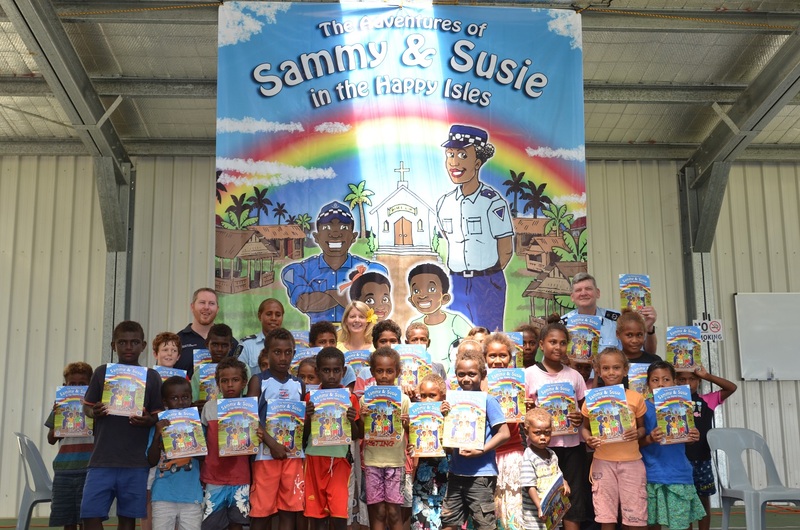 RSIPF and RAMSI launch a children’s story book to discourage alcohol abuse and family violence and build trust in the police. 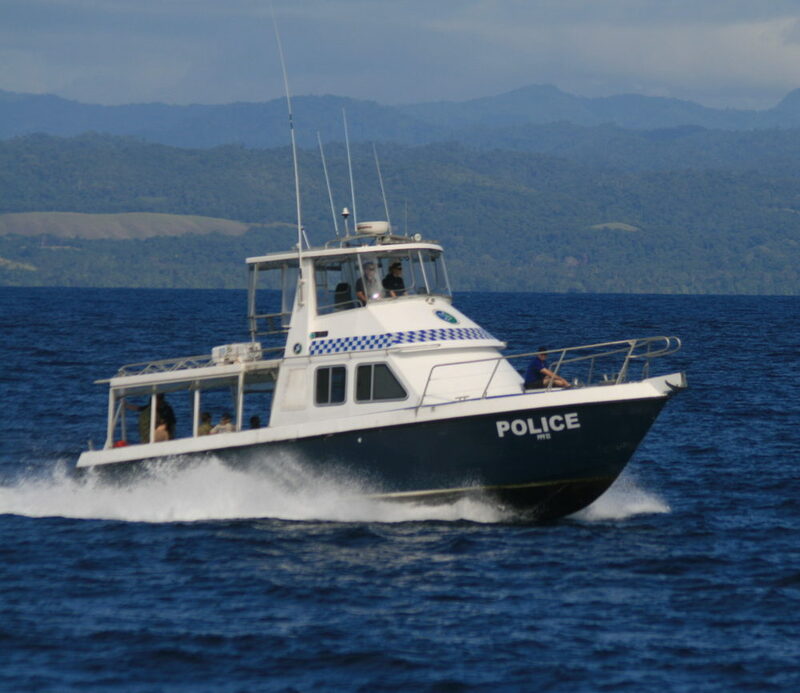 The RSIPF conduct high visibility patrols and boat safety operations throughout the Christmas period. 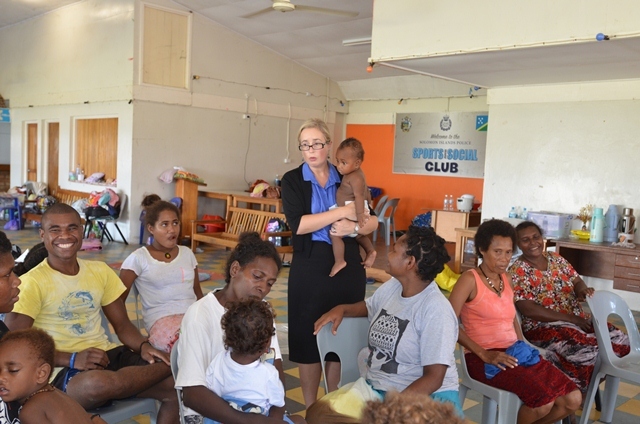 Solomon Islands Government passes the Family Protection Act 2014, which formally recognises protection orders and provides the basis for assistance to victims of domestic violence. 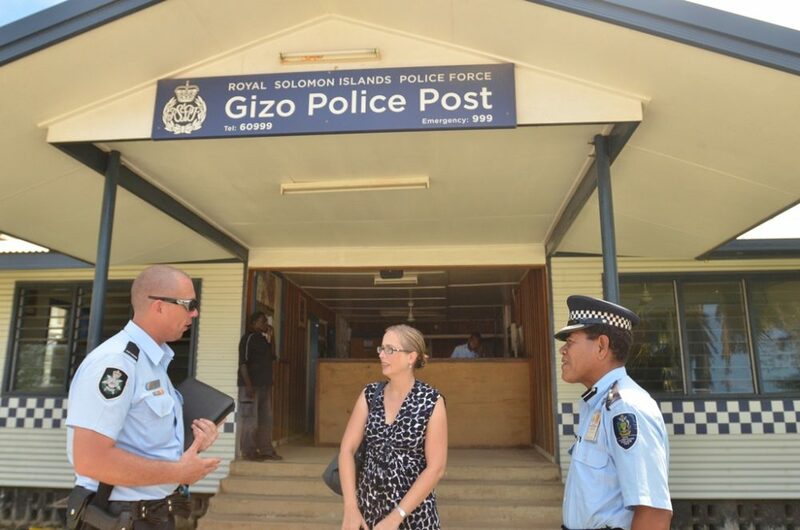 Gizo-based RAMSI police advisers withdraw from Western Province. 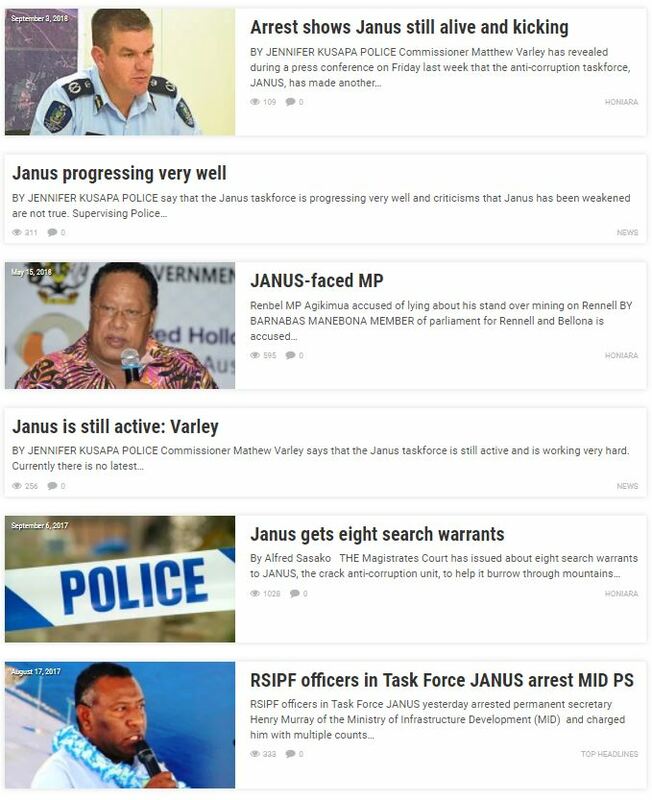 Now RAMSI is only based in Honiara. 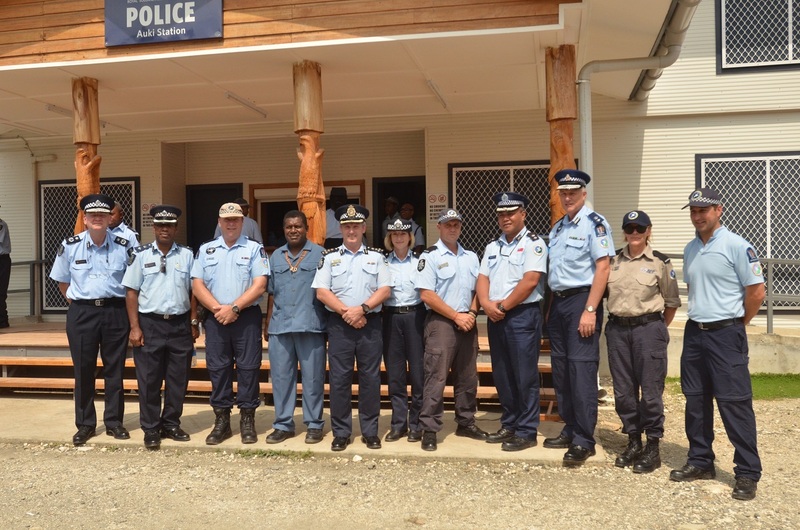 Opening of the RAMSI-built RSIPF National Response Department headquarters and armoury at Rove Police Headquarters in Honiara. 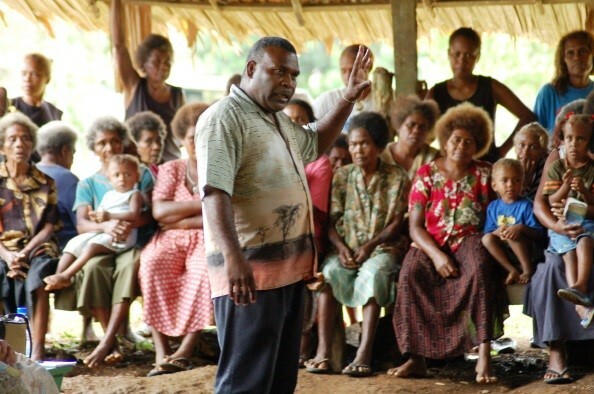 The Solomon Islands Government endorses the RSIPF’s five-year Capability Development Plan, which will inform government decision-makers and guide future development partners. 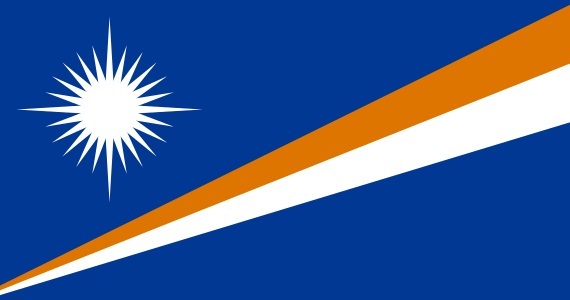 RSIPF and Ministry of Finance and Treasury sign an agreement that leads to the high-profile Operation Janus, which investigates and prosecutes fraud and corruption in the Solomon Islands public service. 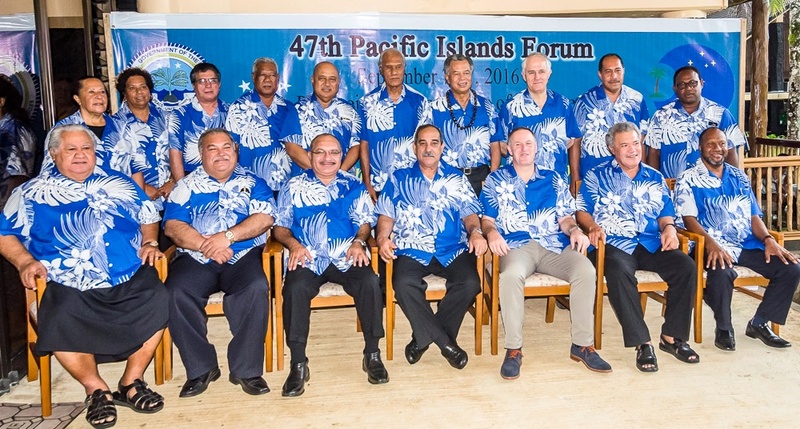 Pacific Islands Forum Leaders endorse the withdrawal of RAMSI in June 2017 and congratulate Solomon Islands and RAMSI on the significant progress made to date. 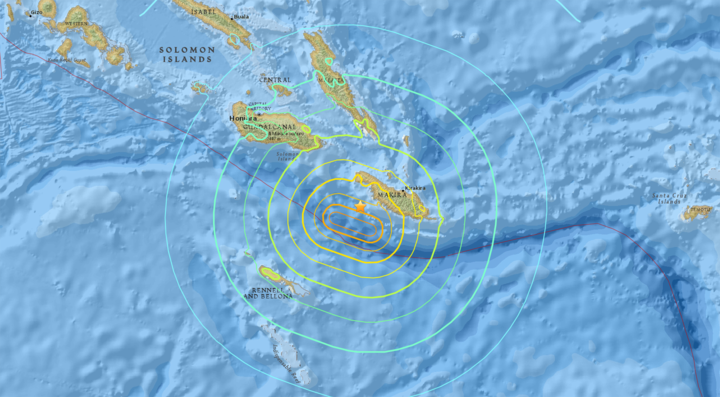 On 9 December 2016, a magnitude 7.8 earthquake struck 70 kilometres south-west of the island of Makira, 187km from Honiara. The RSIPF provide first response, with limited assistance from RAMSI. RAMSI and SIG step up their extensive program of community consultations ahead of RAMSI’s conclusion in June 2017. 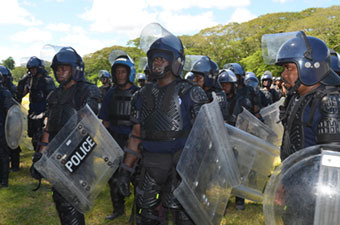 Members of the RSIPF’s Police Response Team and Close Personal Protection team are rearmed so that the RSIPF can protect its communities, borders and waters. Second firearms amnesty and gun collection and destruction program. 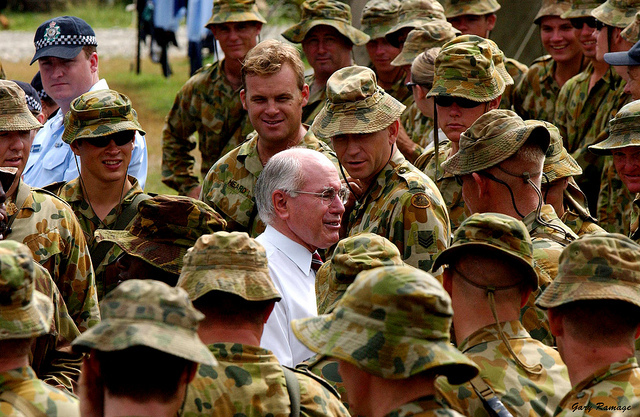 A week of end-of-mission and farewell celebrations commence in Honiara. 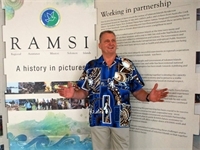 Launch of the permanent RAMSI exhibition at the National Museum, Honiara. The RAMSI mission concludes on 30 June 2017.